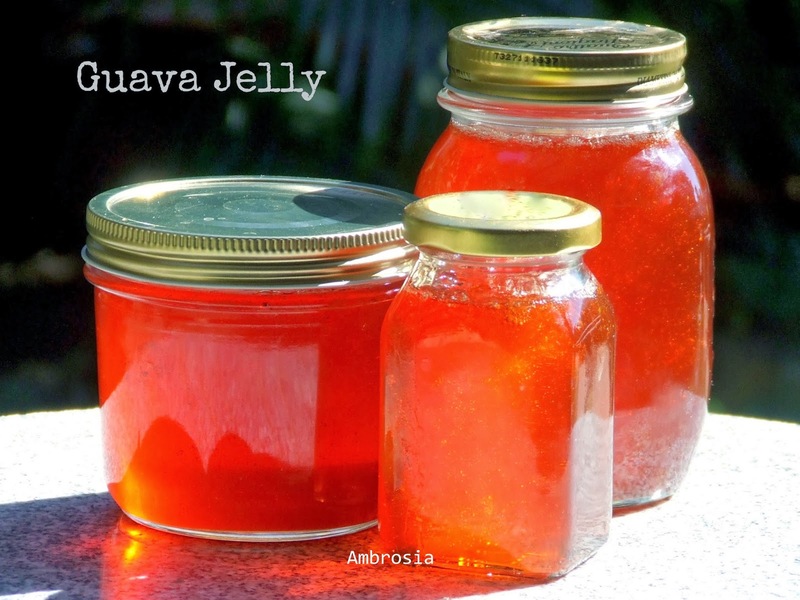 Nostalgia….nostalgia…..nostalgia….whenever I make guava jelly, and the heavenly aroma wafts through and fills up the nooks and crannies of my home with it, my mind too, is flooded with the pleasant memories. Guava jelly evokes memories of a very beautiful part of my childhood. I suddenly find myself back in time in a huge bungalow with an orchard that had all the varieties of fruit trees that were native to our foothills. Dad had a great passion for growing fruits and vegetables. Making jams from his own produce was his ultimate happiness. Our childhood was spent climbing trees, plucking fruits, making bridges on and catching fish from the brook(only to release later) that used to meander across our land, watching birds and chasing butterflies. The guava tree in our orchard used to bear fruits profusely twice a year. The monsoon lot was never too sweet, however, winter crop used to be really plump, sweet and full of pectin. 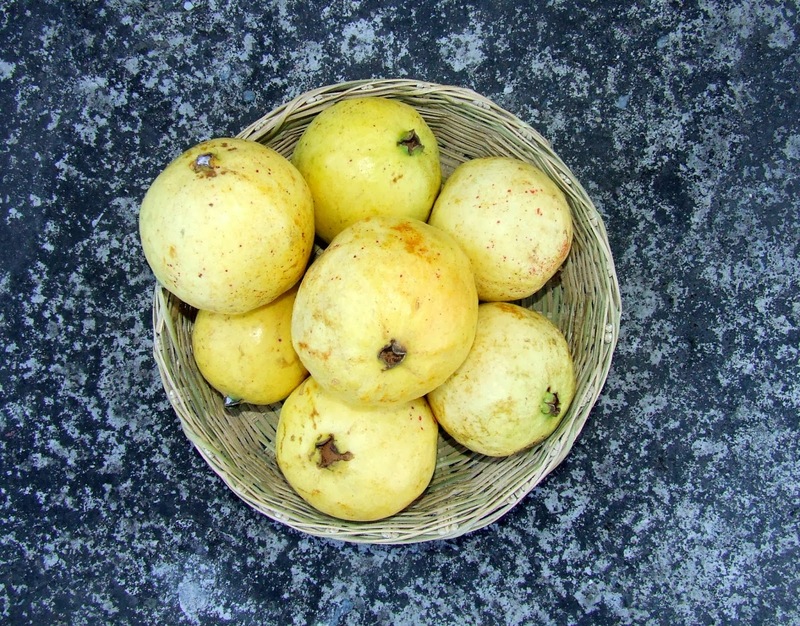 A bag of ripe guavas would be sent to the neighbours, near and dear ones. After having eaten to our heart’s content, guava jelly and guava cheese would be made by my dad every year without fail. When I close my eyes and remember the good old days, I can smell the scent of guava leaves crushed under our feet as we would climb the smooth branches to pluck the fruit..... a tiny drop of bubbling jelly lands on my hand and breaks my reverie…. and I realize that the jelly is almost done. Wish there was a time machine! My dad is old now and forays into the kitchen occasionally. Now I have taken his place and love to carry forward this trend. He is my official taster and a jar is always reserved for him. Wash and dry guavas. Cut them into small pieces. Place the guava pieces in a pressure cooker and add water just enough to cover the fruit. Cook till two whistles. Turn off the heat. Leave it to cool. Take a big size bowl or vessel. Place a strainer that sits well on the mouth of the bowl. Spread a muslin cloth on the strainer. Invert fruit onto the cloth. Hold the corners of the muslin cloth and tie them. The juice should drip through the muslin bag and strainer into the bowl. Hang the bag and keep squeezing lightly till you feel you have collected all the juice. Measure the liquid and transfer it to a thick bottom steel wok. For every cup of liquid, add one cup of sugar and one tablespoon of lemon juice. Cook this mixture over medium flame. Once it starts boiling, cook it on low flame stirring constantly. Cook till the liquid thickens and starts coating the ladle thickly. When poured from the ladle, it should flow thickly and in the end, drops should drip in jointed fashion. Turn off the heat. In the meantime, sterilize the jars. Place the washed and dried bottles with the lids in the oven. Set the temperature to 100 degrees and set the timer to 10 minutes. Remove the bottles and their lids from the oven. Ladle hot jelly into the jars leaving ¼ inch head space. Secure the lids tightly. nice colour of the jelly. Sure it would be very tasty. Such a lovely post Namita. I can almost relive your exciting childhood days. I am definite your father is super proud of you. I always thought you need to set jelly with gelatin. This sounds amazing. Awaiting the guava cheese recipe. 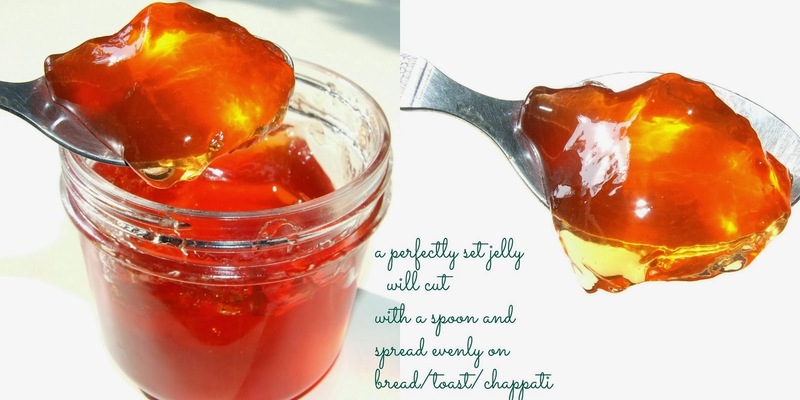 Hi Namita, the jelly is set so nicely & love the golden color to it. There is something special about the recipes which u learn from your parents & I'm sure your family must be proud of u for carrying that tradition. 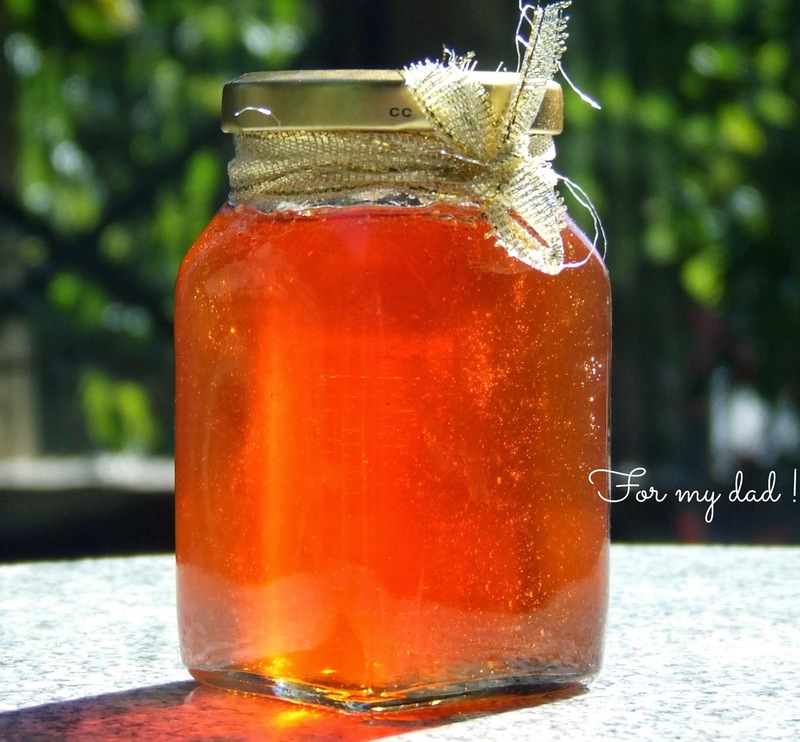 I do remember my mom & my sister making jams & jellies and what I remember of me from that time is climbing up the neighbours Guava tree or other times my brother would climb the big Jamun tree & me and other friends standing under the tree with baskets. I rarely make jellies/preserves.....only when we take a trip to orchard. I wish we could get this good guavas here. Hello Meenakshi, Yes, you may reduce sugar as per your taste. Cook till it sets well. You may take 1/2 cup sugar less from the total quantity. Hope you enjoy your next batch!